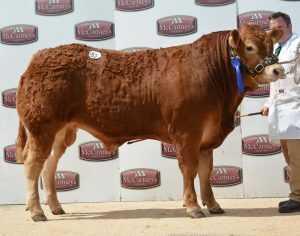 Mr and Mrs PW and SM Greed, Columbjohn Farm Ltd, Columbjohn Farm, Rewe, Exeter took the 6700gns top price with Killerton Mccoy at the British Limousin Society’s May sale held at Brecon Market on Saturday 12th May. 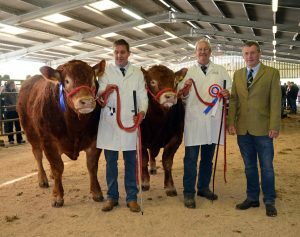 For good measure their bull had also picked up the Supreme Championship in the pre-sale show under the Judge Paul Tippetts of the Wilodge herd, Shifnal, Shropshire. 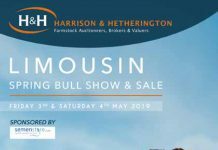 The day saw a good level show of commercial type bulls and the solid trade in the ring reflected this, which is very much continuing the trend seen at markets across the UK in previous days and weeks. 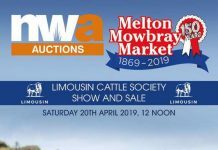 The sale at Brecon brought to conclusion a very successful ‘bumper fortnight’ of Limousin fixtures that have seen robust demand for bulls and females, fantastic clearances and strong averages. The 92% clearance of the 39 bulls forward seeing an average of £3971.04 demonstrates the continued support from the marketplace for the easy calving, feed efficient, cheap to keep, Limousin genetics. 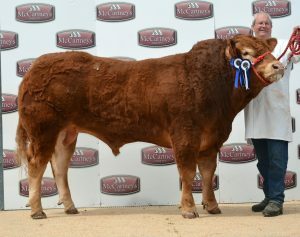 At 6300gns came Ashledge Newark from Messrs AG Kirton and Son, Severn Lodge Farm, Kinlet, Bewdley. The last bull in the ring, March 2017 born Newark is by the Cloughhead Umpire son Haltcliffe Iceman and out of Ashledge Honesty. 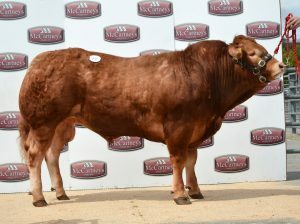 A well grown bull with great length and width he came to Brecon sporting good performance figures including a caving value and beef value in the top 10% of the breed. He was knocked down to JT Lewis and Co, Dolfor Hall, Dolfor, Newtown, Powys. At 5200gns came Foxhillfarm Nottonight from Mike and Melanie Alford, Foxhillfarm, Cullompton, Devon. Placed second in his class in the pre-sale show the January 2017 born embryo calf, by Neuf out of Foxhillfarm Izzy carries a beef value of LM+44. His dam Izzy is one of the Foxhillfarm herd’s most successful ET-bred full sisters to Foxhillfarm Gracie, with a string of show accolades to her name. Nottonight was purchased by Morgan and Jones, Morfa, Aberystwyth. Carrying on their successful run of sales in recent weeks, Mike and Melanie also realised 5000gns for Foxhillfarm Notachance, a January 2017 born son of Ampertaine Gigolo out of one of the herds foundation females 35000gns Bankdale Elizabeth. He was bought by JJ Comer, Barn Cottage, Water Hay, Swindon, Wiltshire. Foxhillfarm Nivana made 4600gns. A class winner in the pre-sale show the February 2017 born Nivana is by the 147000gns Trueman Jagger and also out of Bankdale Elizabeth, which makes him full brother to 8000gns Foxhillfarm Nancy, who sold at Carlisle earlier in the month. Nivana, who carries a beef value of LM+52, was knocked down to S Jones, Garth, Llangammarch Wells, Powys. Also at 5000gns came Twemlows Mighty from Will and Jackie Forrester, Higher Heath, Whitchurch, Shropshire. The October 2016 born class winner had been placed as Reserve Senior Champion in the pre-sale show. By the Sympa son Twemlows Dynamite and out of Twemlows Indigo he was sold to Nempnett Farm Ltd, Blagdon, Bristol. Will and Jackie also achieved 4600gns for Twemlows Mccoy, a September 2016 born bull by the well-known Ampertaine Gigolo and out of Twemlows Jackie. He was bought by G and M Davies, Hafodarthen Farm, Abertillery, Gwent. 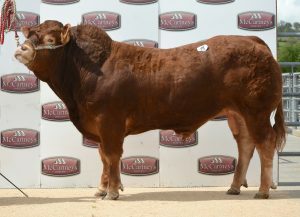 Three lots later and the hammer went down at the same price for Killerton Muddy, another from the Greed family. 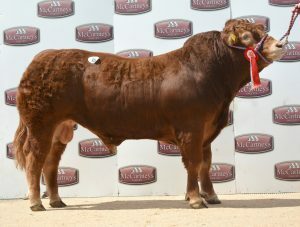 He had been tapped out as Reserve Overall Champion in the pre-sale show which made it a 1-2 for the Greed stable. The November 2016 born bull by Emslies Horny and out of Killerton Eartha was purchased by R P Morgan and Son, The Farm, Lloyney, Knighton, Powys. 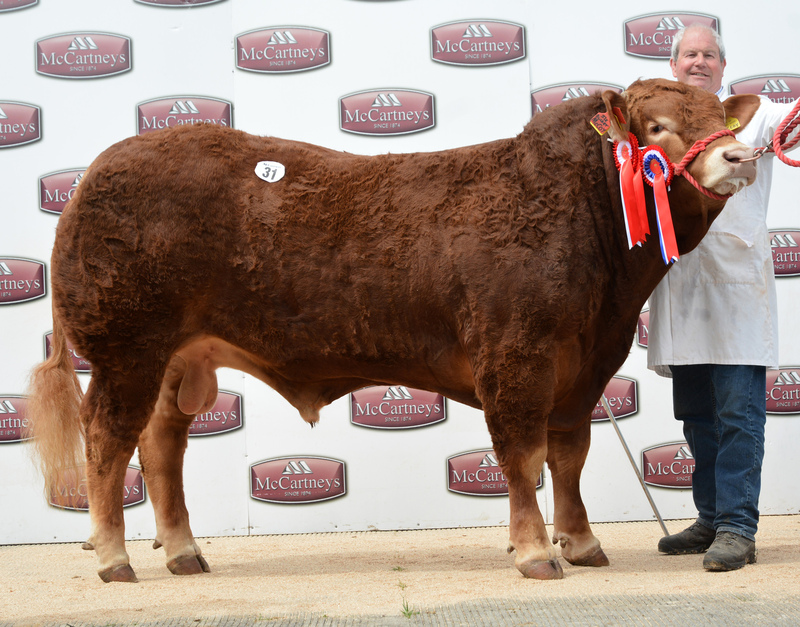 At 4800gns came Bringewood Memphis from Mr A W Smith, Burrington Farm, Burrington, Ludlow. Placed second in his class the September 2016 born natural calf is a son of Objat and out of Bringewood Emily. He was purchased by J Porter, Moor House Farm, Southwick Road, Highbridge, Somerset. 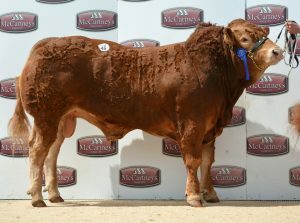 Coming from Mr J H Neale and Son, Launceston, Cornwall, Nealford Norfolk realised 4700gns. By the Ampertaine Elgin son Ampertaine Inferno, who the Neale family purchased for 16000gns at Carlisle back in May 2015, the January 2017 born bull is out of Nealford Jellybean. He made his way home with EJ Jenkins, Black Bush, Abbeydore, Hereford. At 4500gns came Dyfri Mascot from Messrs D G and M J Edwards, Cilycwm, Llandovery, Camarthenshire. The Septermber 2016 born natural calf is by the renowned Fenomen and out of the Wilodge Cerberus daughter Dyfri Mascot. Bred from an easy calving line he came to Brecon carrying an exceptional beef value of LM+58 and two copies of the F94L myostatin gene. Mascot as purchased by M and R Day, Manor Farm, Winchcombe, Cheltenham. Leading the sale of females at 2000gns was a cow and calf outfit from Mr C Jones, Llanarth, Dyfed. The August 2015 born cow Cletwr Lisa and her Foxhillfarm Madman calf at foot was knocked down to E & S Thomas, Tanygroes. Cardigan. The small cohort of maiden heifers all sold very easily, the top price of 1600gns went to Underwood Nadia from Messrs I and W Jones, Builth Wells, Powys. 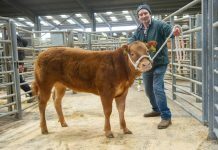 The March 2017 heifer, by Eves Joseph and out of Underwood Elas, was the second purchase for K Tanner, Gellimarch Farm, Cadoxton, Neath. He had bought the preceding lot, from the same vendor, Underwood Minx, for 1580gns.